Keep your lawn in evergreen condition with comprehensive mowing, weeding, feeding, watering and aeration of the grass. 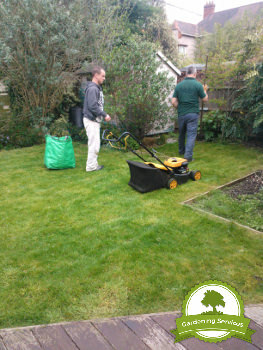 Work with skilled gardeners in Liverpool that have all the necessary tools and knowledge to take proper care of your lawn. A tightly woven turf is achieved by proper mowing and clipping the growing points of the grass. This way it grows denser and healthier. Improve the look of your property with regular lawn mowing and competent fertilising techniques. Bring life to your favourite green place for family recreation. Spring Lawn Care: An important time of the year to take care of your lawn. After the hardship of winter, the grass is just beginning to grow and needs more attention. The spring lawn feeding includes slow release of granular fertiliser that contains high levels of nutrients to strengthen roots and green up the lawn. Early Summer Lawn Care: With temperatures rising, this treatment is adapted to varying growth and weather patterns by applying proper feed and soil conditioners. The main goal - to stimulate root growth, thicken the lawn and get rid of stubborn weeds. Late Summer Lawn Care: Hot weather can make your lawn brown and straw coloured. On the other hand, a wet and cool summer can lead to a drain of nutrients. That’s why your lawn will be treated with conditioners and feeds to encourage long lasting turf colour. Autumn / Winter Lawn Care: In the last few months of the growing season, it’s important to prepare the lawn for low temperatures and lost nutrients. This treatment also controls moss and thatch growth.